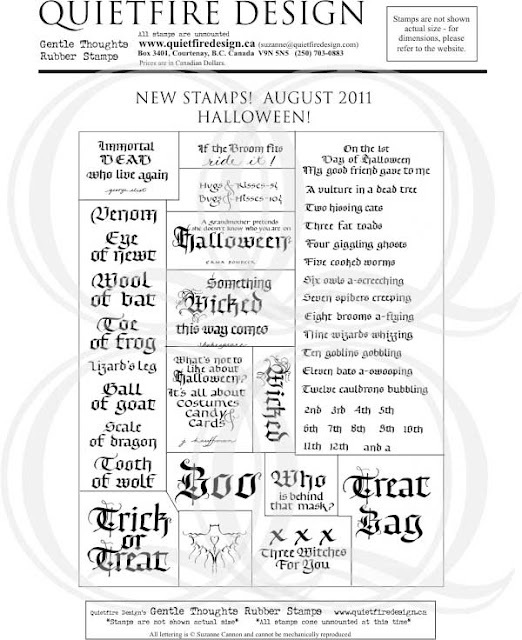 I don't normally do Halloween - that being said, I've already sent some submissions to Vamp Stamp News... so I guess I do do it, and I am soooo looking forward to this sheet of rubber by Quietfire Design. Suzanne did an awesome job of the calligraphy and finding fabulous words and quotes to play with. I'm already visualizing something with the 12 days stamp. AND the great news is, it's available for PreOrder, with shipping starting around September 12th. It will only be available as a full sheet, approx 8 x 10" for preorder now. Of course that gives you fabulous value for your buck. Check out more details HERE or click on stamp image.